On a dark and cold Winter’s day I travelled to the very west of Berlin, to Wannsee. I had my little walkman with me. I wanted to record another Letter from Berlin. The walkman stopped working, and it got back into a short-lived existence when I stood on the platform of the S-Bahn station, waiting for the train to get back home. I wanted to record impressions and parts of Timonthy Snyder’s lecture at the American Academy in Berlin. “How did we enter the contemporary world of polarizing politics and encroaching authoritarianism? All seemed fine after the Wall fell and communism disintegrated—until it was fine no longer. 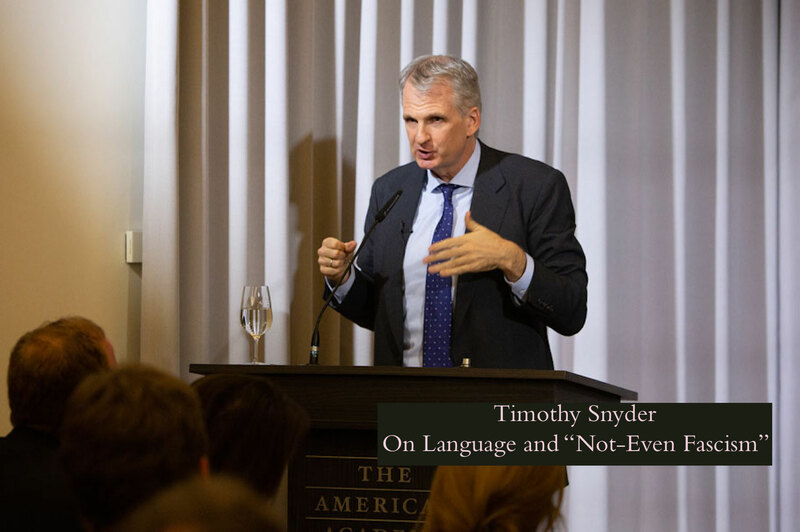 Yale historian Timothy Snyder thinks we in the West became unreflective, and lazy in our use of language. Speaking at the American Academy in Berlin on January 14, at an event co-hosted with Intelligence Squared Germany, Snyder said that authoritarian ways of thinking have actually been enabled by liberal ways of thinking that discredited commonsensical truth, diminished the significance of the state, and refused to admit alternatives to the liberal way of seeing the world. Go here to read and see more. I can highly recommend Timothy Snyder’s lectures. Look here if there will be one near you.